If you’re looking for a lightweight leaf blower that you can use for around your home, then look no further. The Toro 51585 Power Sweep 7 Amp 2-Speed Electric Blower will give you just the right amount of power that you need to complete some light work around the house. The autumn months mean that you will have to find some way to get the leaves out of your yard, driveway and patio. This electric blower will allow you to do that quickly and easily. You won’t find many leaf blowers that are as lightweight as this one, but still produces enough air speed to get the job done. People really like that they don’t have to worry about getting a shoulder strap or hurting themselves because of the weight of the machine. It is quick and easy to get out and get to work. 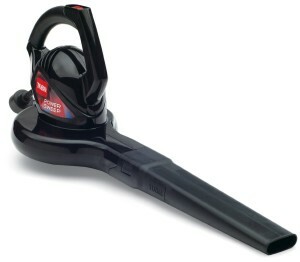 The 2-speed air control allows you to ramp up the air speed if you are blowing a large area of leaves or debris. Even at the higher air speed of 160 MPH, this is one of the quietest leaf blowers on the market. The low speed of around 130 MPH is perfect for blowing debris in tight corners and being able to control the debris. The design of this blower is simple and it is easy to assemble, so anyone can use it. Everything from the location of the start button to the plug is strategically placed to ensure ease of use. The Toro 51585 Power Sweep 7 Amp 2-Speed Electric Blower is not designed for blowing a large amount of leaves or debris that may be wet or slightly heavy. People who have tried to use this leave blower for larger projects became frustrated quickly because it simply isn’t powerful enough for it. Another downfall is that the blower does not come with the cord itself. You have to supply your own extension cord in order to use it. However, this could be at your advantage anyway if you need a longer cord to go out to the farthest corners of your yard. The Toro 51585 Power Sweep 7 Amp 2-Speed Electric Blower is great to have around your house because it will take care of small jobs quickly. If you have a lot of trees at your house, then you will probably need to have a larger and more powerful blower as well. However, for just blowing off debris, grass or some leaves off of your driveway and patio, this is the perfect item to have. If you have any sort of back problems or other issues that usually prevents you from using power equipment like this, then you will enjoy using this. It is lightweight and has an option to attach a shoulder strap if you need it. For such a lightweight machine, this is one of the most powerful and convenient on the market. The Toro 51585 Power Sweep 7 Amp 2-Speed Electric Blower is available for right around $50. You can’t beat the price for the quality and you get in return. Toro was founded in 1914 and is an American manufacturer of lawn equipment. Their customer base ranges from single homeowners to professional contractors and even large sports franchises. As a result, they are a brand that is trusted and well-respected by many different industries. They offer some of the top lawn equipment in the industry as well as affordable options for homeowners. However, they do not sacrifice quality for price, and that is evident throughout their line of equipment.